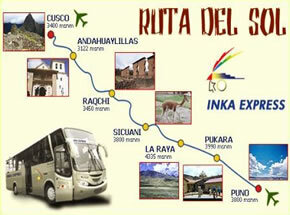 Our trip lasts around 8 hours and we will enjoy 4 guided visits to the turistic places of this zone. Visiting the temple of Andahuaylillas or Capilla Sextina of America, the inca temple of Raqchi, la Raya at 4335 m.a.s.l. and the inka aymara museum of Pukara. Each visit lasts from 20 to 40 minutes, the tourist will able to enquire about any doubt , take pictures and walk around , making this tour very pleasent. Tipic Buffet Lunch: Prepared with andean supplies , you will enjoy the delightful Tipic meals, the varity of the international Novo Andina dishes served in a confortable restaurant in Sicuani. Entrance tickets for all the attractives. Guiding Service on board and for the attractives.